Family members watch investigators at the scene of a fatal accident on Roosevelt Boulevard in the Olney section of Philadelphia, Tuesday. PHILADELPHIA -- Police said two men are being charged over a crash that killed a mother and her three young sons on a 12-lane highway plagued by pedestrian deaths. Samara Banks often called a cab to take her and her four little boys home from family visits on the other side of Roosevelt Boulevard in Northeast Philadelphia, relatives said. But on Tuesday night, she thought temperatures had cooled down enough to walk the mile back home from her aunt's house. Banks, 28, and her three youngest sons were killed as they crossed at a point with grassy medians dividing the traffic lanes, but no crosswalk or traffic light. Her oldest, a 5-year-old, survived with bumps and bruises. "The cab service knows her well," said LaTanya Byrd, an aunt who described Banks as a devoted mother who had helped raise siblings after her own mother died. "Last night, it got a little cooler and she felt she could walk." A police spokeswoman said Wednesday night that two men were being charged with four counts each of third-degree murder, homicide by vehicle and involuntary manslaughter. A witness reported drag racing may have been involved, she said. The two men also will face charges of recklessly endangering another person, aggravated assault, simple assault and aggravated assault by vehicle, police said. 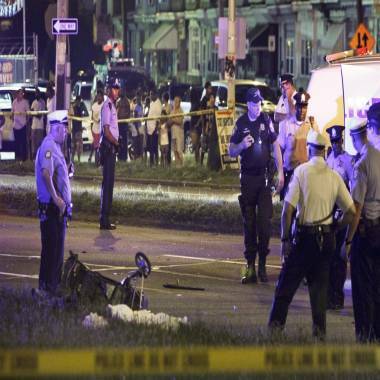 Roosevelt Boulevard had the nation's 2nd and 3rd most dangerous intersections in a 2001 insurance company study, which tallied 618 crashes at those two intersections alone in a two-year period. The speed limit is 40 mph where Banks and her boys were killed, but drivers frequently go 10 or 20 miles above that to make — or run — a light, neighbors said Wednesday. Many residents of the lower-income area don't have cars, and are left to traverse the boulevard on foot to get to schools, parks and stores. Just hours after Banks and her boys died, Iris Rolon chose the same mid-block route to cross with her 10-year-old daughter and 8-year-old niece. They were walking to a city pool on the 95-degree day. "It ain't safe, but I like to wait until I see that the light changes," said Rolon, who admits she once had a close call crossing the boulevard in her youth. Police could not immediately provide more recent data on fatal or non-fatal accidents on the road, but news reports detail a few of them. Police gather at the scene of a fatal accident on Roosevelt Boulevard in the Olney section of Philadelphia on Tuesday. Last August, 43-year-old Michael Romano died after pushing his 5-year-old son out of danger just before he was struck by a hit-and-run driver at 11 p.m. His death came just days after another man was killed in a 2 a.m. hit-and-run nearby. And 36-year-old pedestrian Brenda Rodriguez was struck and killed in June 2009 after she and a friend picked up Chinese food. Witnesses said she was struck as two drivers were racing each other; both of them fled. 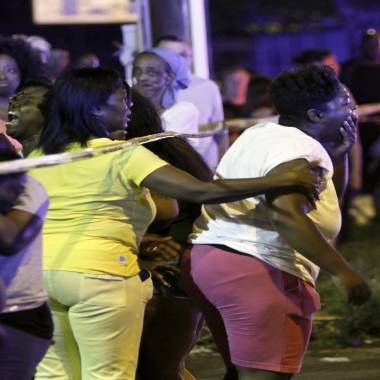 They died even after police installed red-light cameras to try to calm traffic. "Every time I cross the boulevard, I see somebody running the light. I think they don't know there's a camera there," said Angel Mendoza, 32, who lives a block away. The young man being questioned in Tuesday's crash was driving a 2012 Audi, while the other car involved was a 1994 Honda, police said. They said charges are pending. Banks had previously worked at a day care center, and her apartment was often the gathering spot for her large extended family, relatives said. They plan to bury her with her 7-month-old son in a cemetery plot just across the street, and bury her 23-month-old and 4-year-old together in an adjacent plot. "She was a great parent," Byrd said. "When her mom passed, she just took over and got things done."